Torso pitch: -33° to +41° while standing. -33° to +51° while crouching. The Warhammer is a heavily armed and moderately armored Inner Sphere Heavy Mech, possessing modest speed and maneuverability. Able to dish it out and take it in, the Warhammer is a powerful force on the battlefield, capable of shredding Light Mechs and Vehicles, as well as standing toe to toe against other Heavies. The Warhammer possesses a large spotlight that can be turned on with the [L] key. It functions differently than the standard Mech spotlights, as it has a much longer range. When fighting Battle Armor in the Warhammer, players can turn on the spotlight to discern the battlearmor from the surroundings. It also has a narrow vertical field of view, which may make it hard to deal with Aerospace fighters and VTOLs. The Warhammer Prime is the signature mech of Natasha Kerensky. It is also a Knights of the Inner Sphere favorite. With its low price the Prime is a budget favorite and a well-armed mech, possessing a variety of weapons capable of inflicting damage at most any range. 2 PPCs provide the initial mid-range punch, disorienting enemy mechwarriors with cockpit shake and disabling night vision. The Prime's mid-range output is supplemented by 2 MBLs, but it reaches its full damage potential as it closes within 250m. The Prime's 2 SBLs and an SRM6 allow it to step up its firepower as it closes on its foes. The SRM6 provides the primary defense against Battle Armor, allowing the Warhammer Prime to defend both itself and nearby allies from BA ambushes. Being primarily Energy Weapon based, the Prime sports 4 Double Heat Sinks allowing a disciplined mechwarrior to output fire continuously without fear of excess heat. The Prime has a major difference from all other variants. It is equipped with a standard engine which causes no bonus damage to be transferred to its center from a busted side torso. Spreading damage by torso twisting can allow a Prime to survive far longer than its already hard to kill brethren. The Prime can often escape damaging encounters that would have destroyed many other mechs. The Warhammer Prime is dangerous mech capable of handling a variety of threats at a variety of ranges. The Warhammer A is a long range support mech, equipped with weapons meant to dish out damage at extreme range. 2 LtGauss, 1 ELRM15, and a set of EOptics allow the A variant to sit behind the front lines, supporting its allies while staying away from any return fire. Should any missiles happen to fly its way, a LAMS helps mitigate any damage the Warhammer A or its allies might take. 2 MGuns give the Warhammer A some anti-BA punch, while a GECM suite allows it to stay off the radar of all but the closest enemies. A whopping 5 free tons for ammunition means that the A variant has tremendous staying power, and will rarely, if ever, need to leave the fight to rearm. The Warhammer B packs 2 AC10s, a single LPL, 2 ERMBLs, and B-Pods. 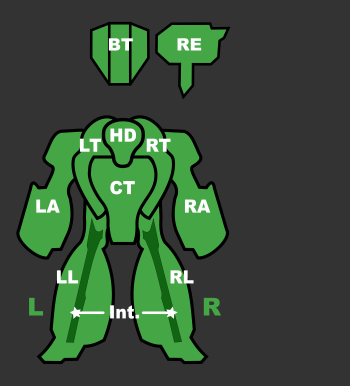 This loadout allows the B variant to shred Light and Medium Mechs as long as the mechwarrior can lead his weapons properly. The B can also stand face-to-face with some other heavies, their large size making them ideal targets. By chainfiring the 2 AC10s, the B can maintain a steady stream of cockpit shake, disorienting their enemies. The B-Pod allow some defence against Battle Armor, to a limited extent. The B has an additional 2 free tons of ammo helping to make it a better mid-range fire support mech, but even with that the Warhammer B can be in need of a short supply line during extended engagements, as its autocannons can become very ammo hungry during intense firefights. The B suffers at long-range combat, but utilizing its GECM can prevent early detection and long-range confrontations. Nothing reaches beyond 500 meters on this one - GECM suite ensures not even radar microwaves. With the least of an firing discipline the 4 LPPC can be fired indefinitely and in short succession - rendering any opponent blind at night, out to 450m. This sole property renders this variant an night hunter of supreme potential. The 2 MPL, reaching out to 400m really add more damage over time than the four PPCs do. While the main trump card of this variant, however, is the persuading potential of the LBX20 cannon and it is backed up by the usual ton of spare ammunition. Utmost care is to be taken that each hit counts as the LBX20 cannon does the majority of the C variant's damage. The selling points of this top priced Warhammer is its night hunting potential backed up by the GECM suite's stealth and extended sencor range provided by BAP, alto note that the stealth can be too easily broken by any stray enemy missile flying by, by the treacherous LAMS. The Warhammer D is the wolf-in-sheep's-clothing of the Warhammer line. 2 ERLBLs and 2 Tbolt5s will lure your targets in for an easy kill of an long ranged helpless low DPS sniper. Brawlers will weather the storm, closing on you with the intent of scoring a quick kill. Once they arrive, however, they'll be in for a nasty surprise as the D variant's main weapon, a single UAC20, roars into life. This weapon is capable of immense burst damage, and will quickly tear into any dents the enemy took from their approach, coring smaller enemy mechs in a few seconds of fire. 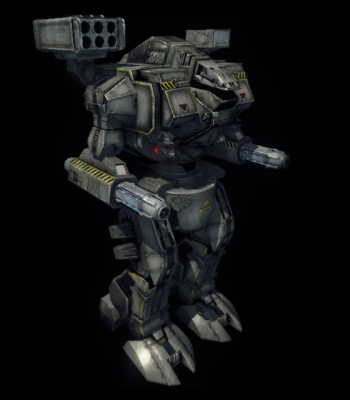 Furthermore, it is also placed high on the mech's shoulder, allowing the mechwarrior to fire double AC rounds at enemies while in partial cover. 4 DHS give the D variant acceptable heat management, and an extra ton of free space ensures that its autocannon has more ammo should the enemy prove tougher than expected. The selling point of this Variant is to have a foot in both of the worlds - snipers and brute brawlers. The E is a superb sniper mech. Armed with 2 ERPPCs and a single Gauss rifle, it is able to quickly deal crippling damage to enemies before they can get into the range necessary to return fire. The gauss rifle's cool nature gives you a good weapon to use while the 2 DHS tries to dissipate the heat produced by the two ERPPCs. Most pilots chain fire their ERPPCs to prevent overheating. 2 ERMBLs mounted in the torsos give the Warhammer E a not-insubstantial tertiary punch that can be used to hasten the destruction of any mech that survives the salvos from its primary weapon systems. EOptics and a single free ton allow the E variant to accurately maintain its full firepower for a decent amount of time. The Warhammer F excels at close combat and can provide modest mid-range support. 2 RAC5s, the F's primary weapon systems, are able to dish out serious damage allowing the F to engage other heavies as well as strip the armor from assaults at close range. A single MRM30 supplements the already great damage provided by the rotary autocannons, and 3 flamers give the Warhammer F the ability to punish any energy-focused mechs that are foolish enough to get close. 3 DHS help dump the waste heat flamers will saddle you with, while 3 free tons give you some staying power before returning to rearm. The Warhammer G is not for the faint of heart. Often called the "Schizo-hammer", the G is a conglomeration of vastly disparate weapons systems, comprising a total of 4 distinct weapon groups. The G is a jack of all trades in the long-range department. At 1000m the G brings in some real firepower with a single LRM15. At 950m the G has an HVAC10 for persistent supressing fire and at 900m ERPPC for for sniping. As point defense, at 400m, the G has two ERSBLs and a pair of MPLs that will strain the G's heat dissipation. Except for the HVAC, every weapons system on the G produces a moderate amount of heat. While at long range its 2 DHS can somewhat manage to dissipate waste heat between volleys, its close range lasers are more heat intensive. In prolonged short range combat, an engagement range that the Warhammer G has no job seeking, pilots will find themselves reluctant to strain their heat levels with their PPC's heats spike, although they should be able to afford a last volley of missiles against an enemy about to close into its minimum range. In such situations the G's heat capacity would be better spent on its HVAC10. Though it sports 2 free tons, enough to carry a single reload for its autocannon and LRMs, mechwarriors should fire conservatively to avoid running out of ammo too quickly. The Warhammer G is an excellent mech to learn about how to manage many weapons systems simultaneously. The Warhammer BattleMech was introduced by StarCorps Industries in 2515 to be "a mobile 'Mech with enough firepower to destroy or severely damage any 'Mech of the same weight class or lower." In the mission it was designed for, the Warhammer proved to be a very capable 'Mech, and for centuries practically defined the entire class of heavy 'Mechs. Boasting incredible firepower and respectable armoring, the Warhammer served prominently in the Star League Defense Force and was one of the premier 'Mechs in the Gunslinger Program. Indeed, many of the greatest MechWarriors in history were Warhammer pilots. In BattleTech, the Warhammer was designed to "destroy or severely damage any 'mech of the same weight class or lower". Being more lightly armored then other mechs of its class, the Warhammer preferred to stay at range where its weaponry was most effective. In addition to PPCs, SRMs, and Lasers, it had two machine guns for defense against infantry. Amongst BT fans, the Warhammer, along with other Mechs designed for the Macross Anime series, is referred as the Unseen. Another Unseen Mech (which was originally planned to appear in MWLL) is the Marauder.